This is old version Tahu Bulat 5.2.1 apk for Android, you can install it if you want to downgrade or install old app. It is top Simulation apps from Own Games. After selling several numbers of products, player’s point and money will get raised. You can use them to improve product with new recipe then increase the price. It has to be side by side with quality because customer will go away when the product is not satisfied. 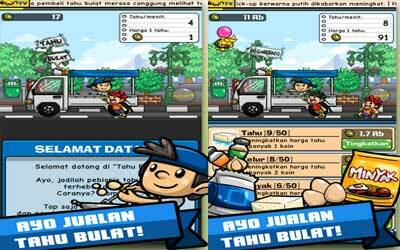 In this game, you learn how to be street food seller who competes to satisfy customer. Another interesting feature is the promotion. Player is able to use ad to attract more customers to buy the product. Moreover, you have to sell food on street using customized vehicle. When you have enough money, you can add accessories or upgrade the vehicle design. It will affect directly to selling result. This game is popular in Indonesia and becomes the major hit on app store. You can download the free version to play basic or in-app mode to get the full features. The graphic is simple yet superb, compared to other games in the same class. There is cloud saving service and guideline before playing. When you finish it, this feature will save your playing history and achievement. If you look for unusual game but with interesting story, tahu bulat for android should be on your top list. Promote the Business Know Round, bring a new type of buyer!